I used to be a habitual writer. I woke up every morning, got the kids off to school, and then sat down at my computer with my coffee and toast. 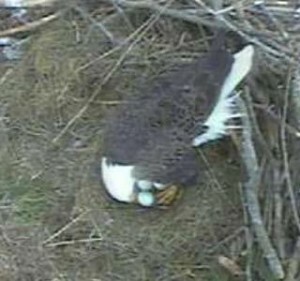 But these days I find myself distracted by something I never expected: the Live Eagle Cam at Blackwater, Maryland. Gail Priest, whom I met on Twitter and have never corresponded with by using more than 240 characters, tweeted when the eagle mom laid her third egg; I happened to click on the link, and I saw the egg, and I watched the eagle on its nest awhile. And then, strangely I returned to the site later that day. And then next morning. And then every day after that. Multiple times a day, even. The eagle rotates its eggs. The eagle cam isn’t a “live” shot: the screen shows a still picture that refreshes every 15 seconds. Before I sit down to write I check the shot. Then I stick around for another 15 seconds to watch the next shot. I might take in five or six shots before coffee. Later, when I break for lunch, I check it again. The eagle doesn’t do much. Basically he or she moves his or her head (both mother and father eagle take turns nesting and I can’t tell one from the other, although I read that the mother is longer). Sometimes the eagle gets up and turns around. Once I saw both eagles together in the nest as one spelled the other at egg warming. It turns out that the eagles have to turn the eggs every few hours to get them evenly warmed. They do this with their very sharp talons, rolled up slightly so they don’t puncture the eggs, and they do it very carefully. I probably wouldn’t be writing about this on my blog if I didn’t think there was some parallel to writing — and I do think that, only I don’t know what, exactly. Writers have to incubate our work sometimes — is that it? Or is it that we have to roll our work over gently every so often with very sharp talons; i.e., language? Or does it remind me of the tedium of sitting at our desk every day while we wait for birth (the end of the novel)? The sight of the eagle moving its head around in 15-second intervals as it keeps watch for predators or just looks at the world is calming, and somehow inspiring. A lot of the reason why I watch is because I want those eggs to be well and I want to watch them hatch — though this won’t happen for another three weeks. Once I watched a chick hatch out of its egg at a petting zoo when my children were young, and my husband and I were mesmerized (my children ran off after about two minutes). It took a long time, and I kept giving my son coins for food pellets so he would stay feeding the four-legged creatures so I could watch the egg. Later, I wrote about this in my novel Thieving Forest. I don’t know what, exactly, moves me about watching these eagles, but I’m rooting for them, and I admire the way they just sit there hour after hour. If someone placed a Writers Cam above my desk I think any viewer would stop watching after about ten seconds. Only my fingers move; unlike the eagles, I don’t even look around. Not very interesting. But this is my job, and it’s a good one. Even if the novel I’m working on doesn’t come out so well in the end, even if it’s a dud, this is what I do. That’s my message, maybe. It’s good to remember to keep my sights on the writing, not the outcome. This moment. Just this moment.